The iPod Nano 5G is yet another iPod Nano product from Apple. The iPod Nano 5G stuck with the original design of the previous iPod Nano's, it's very rectangular in shape, has a large screen, and it's slim and compact. Again, it comes in many different colors, so it's very versatile and it can be customized to your liking. The iPod Nano 5G has the large screen, so again, it needs LCD screen replacement services quite commonly. 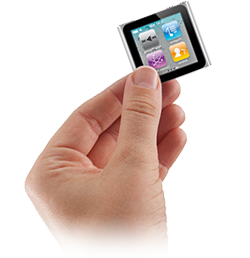 The structure of the iPod Nano 5G is actually more compact and durable than the previous releases. This ensures that the case is well protected in case it is dropped. Case repairs and complete rehousing services are very low cost for the iPod Nano 5G, so if it is broken or if the case has become damaged in any way, it is very inexpensive to have repaired. Select this repair if your battery is not lasting as long as it used to. Send it in to us for a brand new battery and a new lease of life for your Nano 5th generation. Select this repair if the click wheel on your unit is not responding correctly or your are unable to scroll using the wheel. This repair includes the replacement of the click wheel assembly. Select this repair if you have managed to break both the external glass lens and the internal lcd display. Select this repair if you have damaged or broken or damaged the screen. This repair also covers white screens and inked screens. Please select this repair if you want to replace your old or damaged front casing. Please select this repair if you are having problems with the sound coming from the headphone socket. Common Problems include No Sound or Sound only coming from one channel. Select this repair if your Nano 5th Genration no longer syncs with iTunes or does not charge via the dock connector.